With its mild flavor and firm texture, swordfish is the perfect fish to use for these delicious grilled spiedini (Italian for skewer). The preparation is easy and quick. 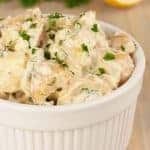 The fish is cut into cubes and briefly marinated in a simple blend of olive oil, freshly squeezed lemon juice and salt and pepper, then threaded onto skewers and grilled. 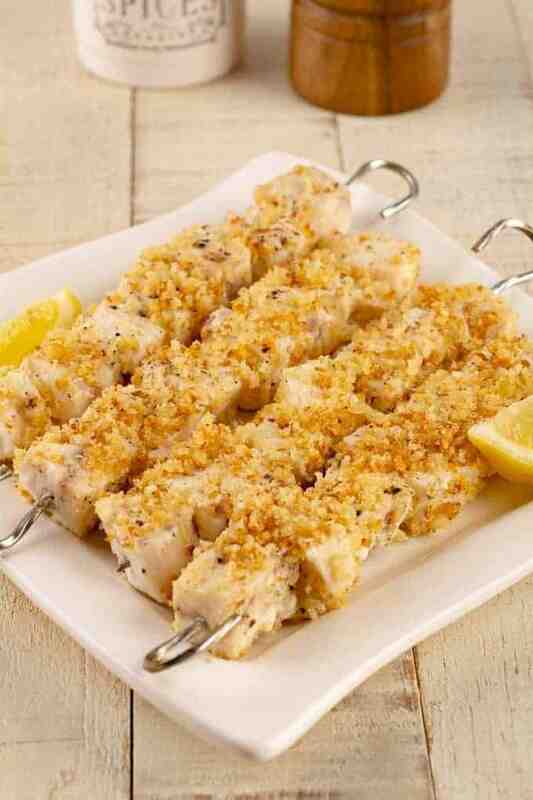 Once cooked, the skewers are rolled in panko crumbs that have been pan-toasted with loads of minced garlic and freshly squeezed lemon juice. 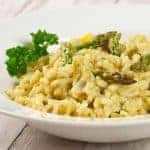 The end result is an incredibly flavorful main dish that can paired with your favorite Italian-style side dishes or served with a simple salad for a light summer dinner. 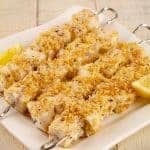 These swordfish spiedini (Italian for skewer) are seasoned with a simple combination of olive oil, lemon, salt and pepper, grilled and rolled in toasted garlic crumbs before serving. Preheat a gas or charcoal grill to medium-high heat (you can also use a broiler – see notes). If you’re using wooden skewers, set them inside a shallow dish and cover with water to soak. 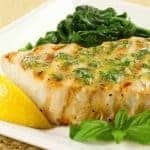 Trim the skin from the outer edge of the swordfish steak and discard, then cut the fish into 1-1/4-inch cubes and place them in a shallow bowl. 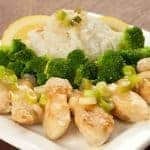 Drizzle with 2 tablespoons of the olive oil and 1 tablespoon of lemon juice. Season lightly with salt and pepper, toss to coat the fish thoroughly and set aside at room temperature for 10 minutes. Melt the butter in a frying pan over medium heat. Add the remaining tablespoon of olive oil along with the garlic and sauté, stirring frequently, until soft and golden, 3 to 4 minutes (do not brown). Add the crumbs, combine well and continue cooking, stirring often, until the crumbs are lightly toasted. Drizzle with the remaining lemon juice and toss the crumbs to distribute the juice evenly. Season to taste with salt and pepper and continue to cook just long enough for the lemon juice to be absorbed. The crumbs should be moist enough to adhere to the fish, but not soggy. Spread the crumb mixture on a plate and set aside. Thread the swordfish cubes onto 4 skewers and liberally oil the grill grates. Place the fish on the prepared grates, close the cover and grill until the fish is cooked through (5 to 7 minutes), turning once halfway through the cooking time. Roll each of the skewers in the crumb mixture, transfer to a serving plate and spoon any remaining crumbs on top. Serve immediately. These swordfish skewers can easily be cooked in the broiler instead of the grill. Position an oven rack 4 to 5 inches below your broiler and preheat for 7 to 10 minutes. Coat the broiler pan with nonstick spray and arrange your skewers about 2 inches apart. Broil until the fish is cooked through, 5 to 7 minutes, turning once midway through the cooking time.